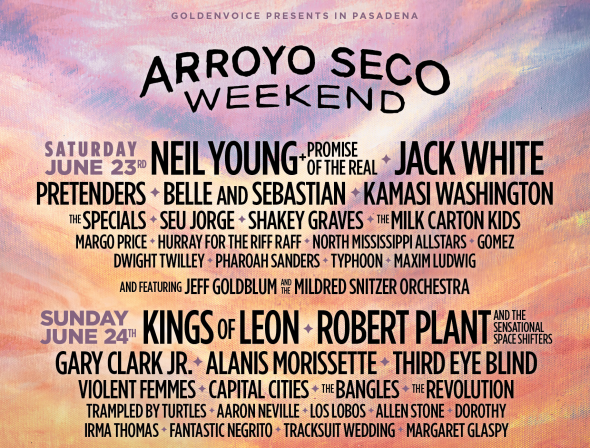 Arroyo Seco Weekend returns to Pasadena June 23 and 24! The colorful music festival will take place at Brookside Golf Club next to the Rose Bowl. Headliners include Kings of Leon, Jack White, Third Eye Blind and more. The festival will also feature curated food and craft drinks by Los Angeles’ top chefs and restaurants such as Hanjip, Fritzi Coop, and Block Party. If you’re planning to attend the festival, avoid traffic and the hassle of parking by going Metro — just take the Gold Line to Memorial Park Station and walk 5 minutes west on Holly Street to catch the free Rose Bowl shuttle from Parsons Lot B. Shuttles start running to the festival from 10:30 a.m. until 8:30 p.m. Return trips run from 7 p.m. to 1 a.m. on Saturday and until midnight on Sunday. Or consider Metro Bike Share, there are stations all around Pasadena — and at Memorial Park Station and the Rose Bowl. Additionally, going Metro means you get a free pair of Arroyo Seco Weekend earplugs. To receive the earplugs, show your valid TAP card at the Metro booth on the concourse. To avoid long lines, load your TAP card with round-trip fare ahead of time. Round-trip fare is $3.50 stored value + $1 for a reusable TAP card if you haven’t already got one. For trips only on Gold Line (with no transfers), the last trains leave Memorial Park Station at 2:35 a.m. on Saturday and 1:15 a.m. on Sunday. Those transferring to other lines, the last trains leave at 1:35 a.m. on Saturday and 11:35 p.m. on Sunday. Follow @metrolaalerts on Twitter for service updates. To plan your best route, use the Metro Trip Planner.